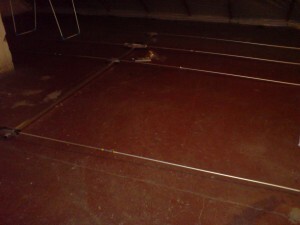 And this picture was taken with a small unmatched indoor piece of wire. Recently Jim, N2ADR released a new version of his FPGA code for the HiQSDR/N2ADR frontend. This brings improved TX filters that should now also support FM and DRM TX. 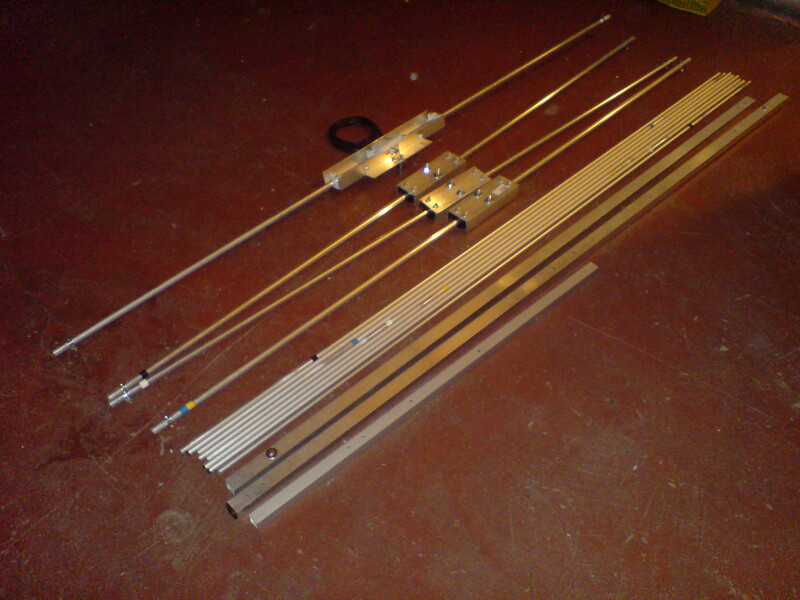 Stefan, DL2STG ported his HiQScope extension to the new Verilog code. This made me want to give it a try. 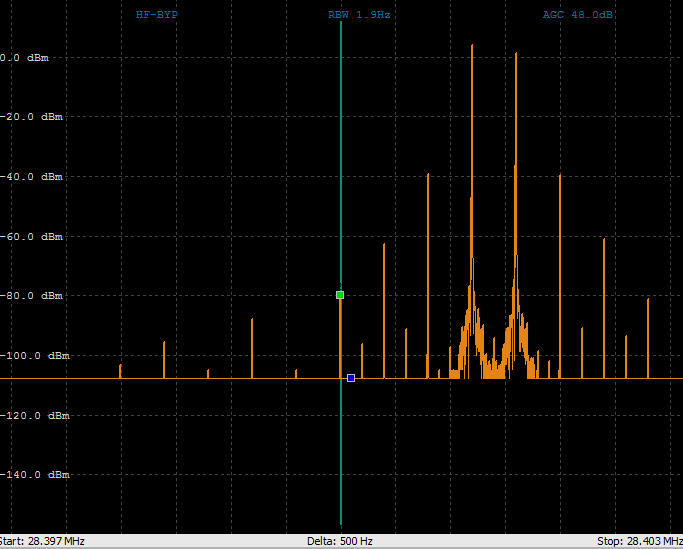 It is really impressive how this makes the HiQSDR a 60MHz Bandwidth spectrum analyzer with waterfall functionality. 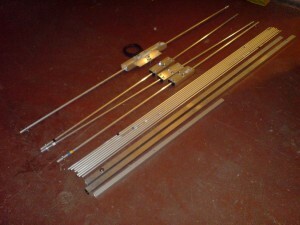 And it can run in parallel to the regular transceiver application. 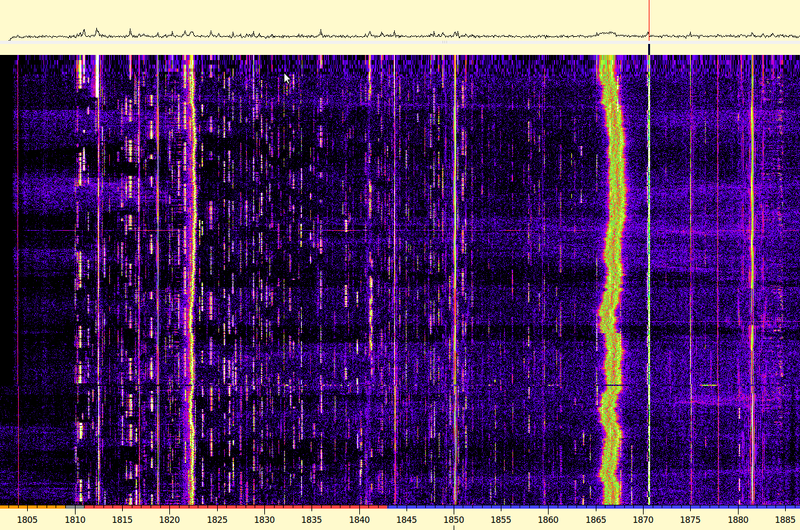 The screenshots below show the unfiltered spectrum from a short mobile shortwave antenna. 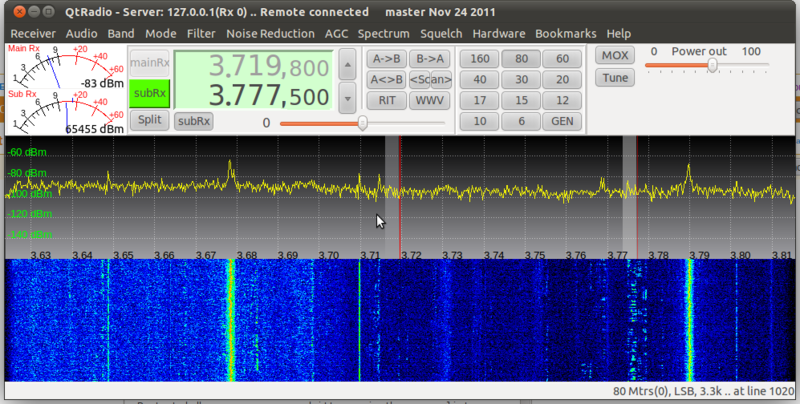 The big signals above 16MHz are images of the extreme strong FM radio stations that i have here. Below the shortwave radio bands can be seen. It´s nice to see and very robust. 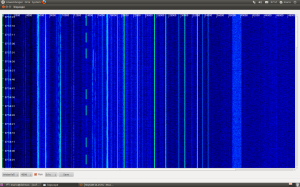 during weekend i took a screenshot of the TX signal quality of my HiQSDR PCB. 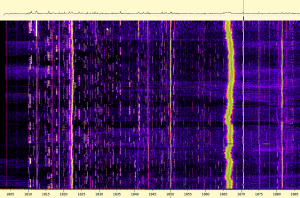 As example i put the IMD spectrum for 10m here. Looks quite nice, doesn´t it ? 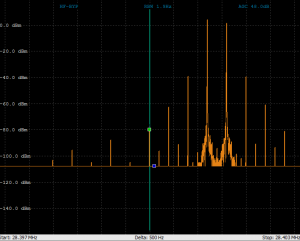 Its the DAC signal amplified by MMIC. I think it was around 6dBm output power. I tried QtRadio + the gHPSDR-server which now also supports the HiQSDR frontend. The server runs on the PC connected to the frontend. 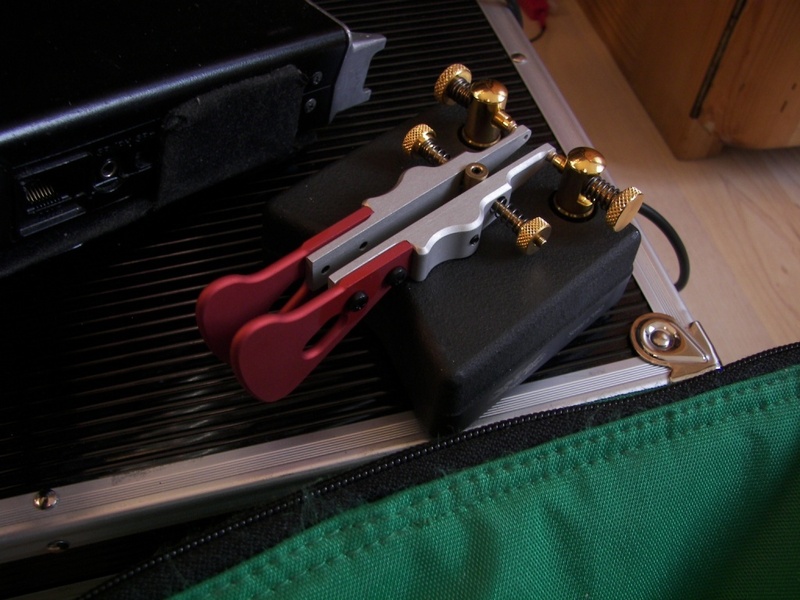 The QtRadio application can run on another PC and can also be connected via Internet. 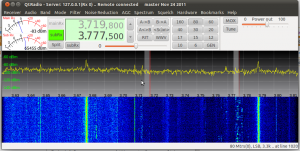 The server supports Softrock radios and the Perseus as well. TX support is in progress. It is also possible to share your radio with others this way. 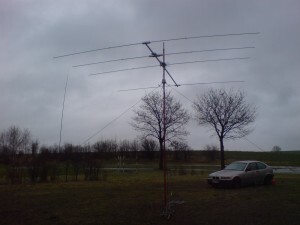 today 10m contest from Bayerhoehe nr Dresden. I used my new 4el and a vertical. The vertical was nearly useless this time. My internet connection did not work. Rest of the rig worked perfectly fine. I just should have spend some time on try some test logging before. So i had some trouble with CW makros during the beginning of the contest. The conditions were really poor. 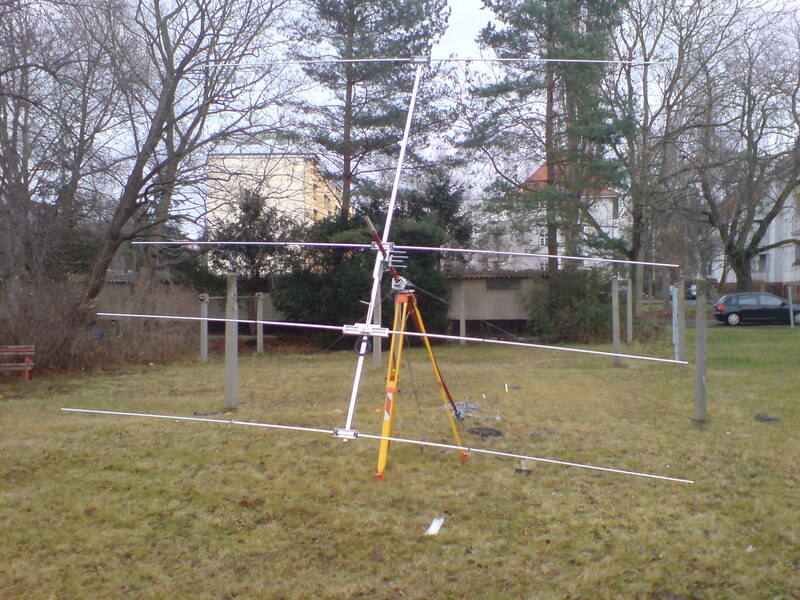 Signals from stations in the south of germany had much multipath which made CW signal sometimes understandable.